Last night we saw the L.A. Galaxy sneak by Seattle Sounders FC on the away goals tie-breaker rule despite losing the second leg of the Western Conference finals 2-1. They are now set to face the New England Revolution in the finals, after the revs took care of business with a 4-3 aggregate win against the New York Red Bulls (I called that, btw). Let’s take a look at how the conference finals went the way they went, and maybe, if you’re good, Jobu will drop some more magically delicious predictions for the final. I was in Cape Cod for the weekend doing some fun stuff for my upcoming nuptials, so I expected to see a lot of Revolution love around. Disappointingly, I didn’t even see one t-shirt. For shame, Cape Codians. Anyway, on the pitch, in front of 32,698 people at Gillette Stadium, the Revs did what they had to do against the Wright-Phillips-less Red Bulls, although it certainly wasn’t easy. The Red Bulls, who needed to win by two, or win with three away goals, almost pulled this one off. They actually held two separate leads in this matchup. Australian international Tim Cahill, who has looked all but done since his stellar World Cup performance for the Aussies, was a complete nuisance in this game, and he got the Red Bulls on the board with a pesky goal in the 26th minute. Unfortunately, Charlie Davies knotted the game just before the half on a beautiful ball from Chris Tierney. Frenchman Péguy Luyindula gave the Red Bulls a 2-1 lead by cleaning up a loose ball in front of the net in the 52nd minute, which gave the Red Bulls a chance to force extra time in this one, but the Red Bulls couldn’t hold on. In the 70th minute, that damn Charlie Davies headed home another beautiful ball from that damn Chris Tierney, and the Revs would hold on for the tie, and the 4-3 aggregate win. Cahill had a chance to put the Red Bulls up 3-2 (and secure the away goals tie breaker win) late, but he missed from about six yards out, and that was that. I was a bit disappointed in this series, because you could argue that the Red Bulls actually outplayed the Revs in each of the two legs, but the Revs did a great job of taking advantage not only of mistakes, but also of the opportunities they got in front of the net. This also ruined the Landon Donovan vs. Thierry Henry narrative for the final, as Henry’s announced today that his Red Bulls (and possibly MLS) career has come to an end (although I still think NYCFC should go all out to bring him in). Anyway, Congrats to coach Jay Heaps and the Revs. We’ll see you next year Red Bulls. For the first 53 minutes of this game, things looked pretty bad for the Galaxy. Donovan’s squad had won 1-0 in Los Angeles, which left them slightly less comfortable than they would like to have been heading to Seattle. When the Sounders, who were playing in front of 46,758 at CentruryLink Field, put two in the net in the first half, things looked bleak for L.A. Brad Evans got the scoring started when he ended up all alone in front of the near post in the 26th minute and popped the ball in the back of the net. The second goal came just 6 minutes later, when Clint Dempsey started a play near the box, diving to successfully pass a ball to DeAndre Yedlin on the wing. Yedlin tried to center it to Obafemi Martins, but it was deflected back to Dempsey at the top far corner of the box. The native Texan blistered a shot that hit Galaxy Defender Omar Gonzalez on the way past sprawling Galaxy keeper Jaime Penedo, and the Sounders had the 2-1 aggregate lead, which they held onto into the half. Oof. It took just nine minutes for the Galaxy to equalize in the second half. The goal came on a low worm burner type of shot from Juninho that kissed off the back post and into the net to cut Seattle’s lead to 2-1. More importantly, it tied the aggregate score at 2-2. Most importantly, it gave the Galaxy that precious away goal, and the tie-breaker win. By the way, Landon Donovan was credited with an assist on the goal, tying him with Mauricio Cienfuegos for the most assists in MLS Playoffs history (14), because of course. Donovan nearly sealed the deal with a late goal, just missing wide right during stoppage time, but it didn’t matter, as L.A. held on. So now the stage is set for the ultimate MLS Final. Sure, it would have been nice to have the Red Bulls in the finals because of Thierry Henry and the fact that New York is a huge market, but the story is all about Landon. This is how this cup was meant to end, with Donovan, the best player in the history of American fútbol, vying for one last MLS Cup in his last career game, in front of his home crowd. Wowsers, Penny! I have to pick the Galaxy here. The story is just too good to go any other way. Also, how heartbreaking would it be for Donovan and his fans if he were to lose? That can’t happen, can it? He has to win. He has to go out on top. Also, he’s probably going to score, right? Has to? I hope he actually gets an assist, so that he can alone at the top of that list as well. If you hadn’t guessed, he’s already the all-time leading scorer in the MLS playoffs. I know the Revs are on a good run, but they could have easily lost their series against the Red Bulls. They didn’t dominate like they did against the Columbus Crew, or in the weeks leading to the playoffs. They can be beaten, and the Donovan karma will be too much to overcome. 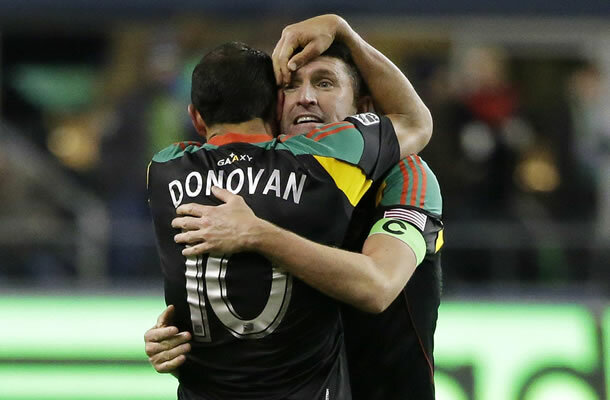 The Galaxy will beat the Revs for the third time in MLS Cup history, 3-2, and Donovan will take home the cup. They should actually let him keep it.